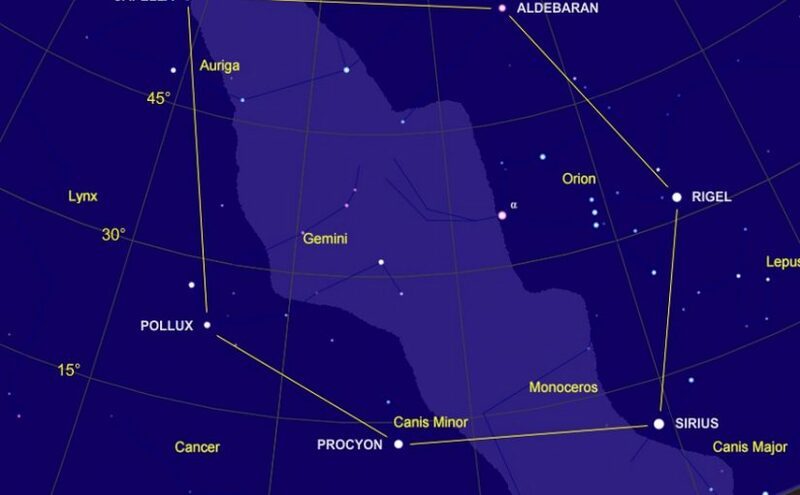 You can see a time machine of sorts in the eastern sky this month. It consists of 6 bright stars from 6 constellations arranged in a large hexagonal pattern. The chart above shows tonight’s sky at 2300, which might be inconveniently late for some observers. 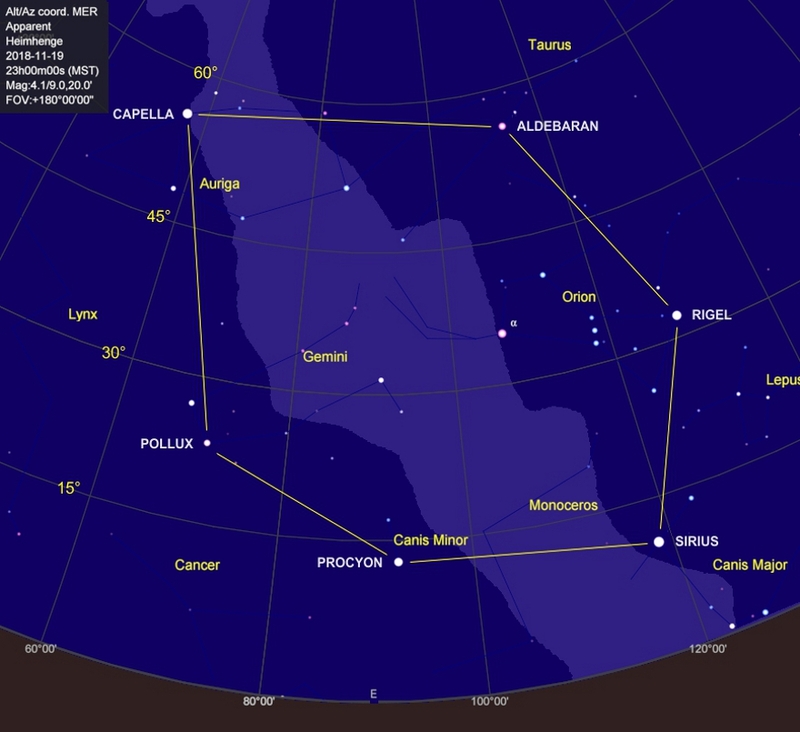 But the late hour means darker skies and less light pollution, so the Milky Way (light blue area) will be better visible. Click to enlarge. 30 days from now these stars will be in the same configuration, but will rise 2 hours earlier (2100). The stars shift to the west (in unison) by about 1°/day because Earth orbits 360° around the Sun in 365 days. And 30° of shift equates to 2 hours of time because Earth rotates 360° in 24 hours. As you survey this sextuplet, consider that the light entering your eyes from Sirius left that star 8 years ago. It’s been streaming through space at the speed of light (300,000 km/s or 186,000 miles/second) for 8 years and is just now reaching Earth. You are seeing Sirius as it was 8 years ago — not as it is now. Had Sirius exploded in 2011, you wouldn’t see the flash until next year when the end of the light beam arrives. The Universe is literally a visual time machine. As you gaze at Sirius think back and ask yourself: What was I doing 8 years ago when those photons of light began the long journey from that star to my eyes? It’s interesting to know that, whatever you were doing, wherever you were, those photons were just then starting on a path that ends where your eyes are tonight. Now move on to Procyon. What were you doing 11 years ago? Continue moving back in time star by star around the hexagon. 34 years? 42 years? If you’re lucky enough to “qualify” for Aldebaran, recollection of events 65 years ago might be a bit more difficult. So get outside and find the hexagon. The stars are all bright and easy to spot. There’s another bright star inside the hexagon that didn’t make my list. Opposite Rigel in the constellation Orion is the red supergiant Betelgeuse (labeled α on the map) at a distance of 642.5 LY. Like Rigel, it’s too far away to relate to personal experience, but nonetheless worthy of note as the 10th brightest star in our sky.